Average surface air temperatures are rising, with the largest increases found at high altitudes in Hawai‘i. Over the past century, rainfall has decreased across much of the region. There has been a slight increase in rainfall in the westernmost Micronesian islands. In Hawai‘i, groundwater discharge to streams has significantly decreased over the past 100 years. This trend indicates a decrease in groundwater storage. 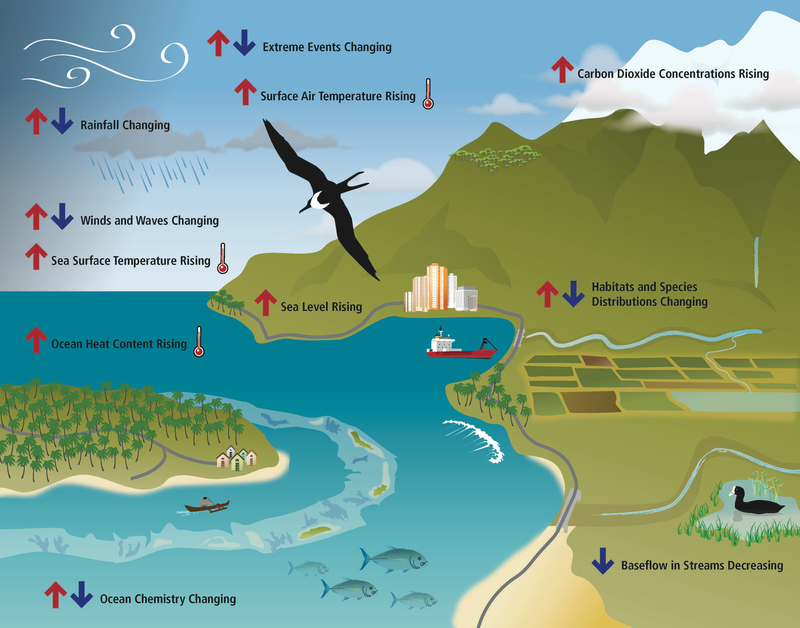 Mean sea levels are rising, particularly in the Western Pacific. Across the region, the frequency and intensity of climatic extremes are changing. Drought has been more frequent and prolonged, and there have been fewer tropical cyclones. diseases that cause mortality in Hawaiian native forest birds. Ocean heat content is rising and ocean chemistry is changing.